Conference recordings are now available! Simply click on a link to an audio file in order to stream the content. To download an audio file, you must right click on the link and choose: "download linked file". You must then open the file on your computer. Downloading will allow you to search the audio (fast forward & rewind), whereas streaming will not. The Path of Law, as Justice Holmes articulated in his seminal paper, is in constant development – like the development of a planet – each generation taking the necessary step forward. Advancements in AI promise to change our society in the years to come and will drastically affect every aspect of our legal norms. It is therefore crucial for us to confront the legal and ethical issues that these advance- ments will doubtless give rise to and to aspire to create guidelines to help us navigate the inevitable changes to our society. 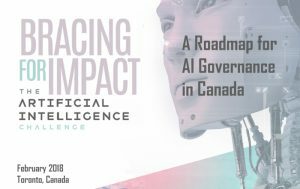 In this regard, we hope that Canada can provide a road map for the legal treatment of AI issues in several key areas. Future developments in the field of AI pose a challenge to intellectual property. The current legal regime does not offer protection for AI creations. Thus, registering AI patents and allocating copy- right protection for AI inventions and works is not yet possible. As a result, AI creations might fall under the public domain. We wish to address these concerns and to offer new insights and suggestions for the upcoming era. Cybersecurity is quickly emerging as a crucial component of every nation's security efforts. Recent events around the world have proven the importance of developing the tools needed to face this challenge. AI poses both a risk and opportunity. This Panel will explore the possible changes in mod- ern cybersecurity warfare in the AI era. In doing so, it will bring to the table several experts in the field in an effort to shape a better government cybersecurity policy for the next generation. Society is in crisis. The gap between the poor and the rich – whether in terms of age, income or skills – keeps widening as inequality grows markedly. Artificial Intelligence holds great potential for help- ing us to lessen these inequalities. While AI is often viewed as a threat to social justice, the opposite may in fact be true. Machine learning in language translation technology can collapse the barriers between third world countries and the West. Algorithmic decision-making can lessen the negative effects that bias has on minority groups. From transportation, healthcare and agriculture to sustaina- bility and governance - the positive applications of AI are unlimited in scope.